Devnagri script gets equal importance with Roman script when new currency notes in denominations of rupees 500 and 2000 have numerals of notes’ denomination are also printed in Devnagri script, while till now numerals on currency notes used to be only in Roman script. 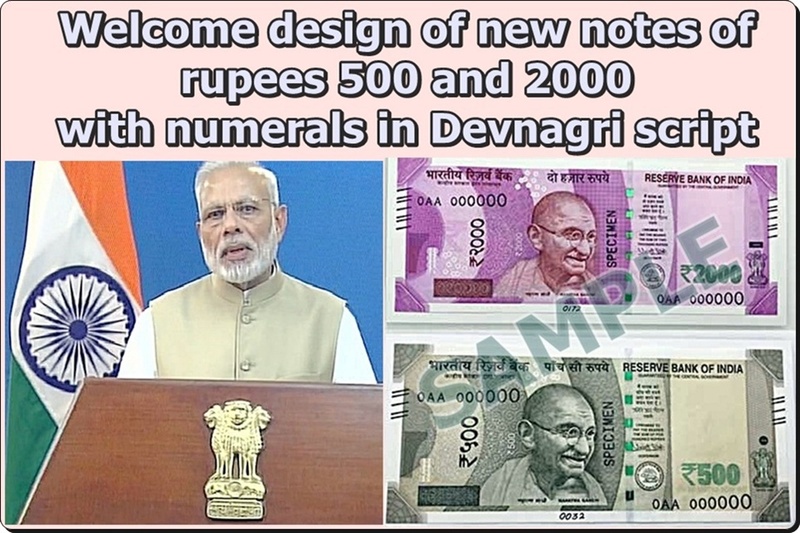 New-designed currency in lower denominations should also be issued with notes’ denominations in Devnagri script. Reserve Bank of India (RBI) should also speed up process of issuing plastic-currency where the then Union Minister of State for Finance Namo Narain Meena in a written reply in Rajya Sabha on 12.03.2013 had stated that Union Government and RBI had decided to issue polymer/plastic currency-notes of rupee-ten denomination on trial basis in five select cities namely Kochi, Mysore, Jaipur, Bhuvneshwar and Shimla with varied geographic locations and climatic conditions.